It can be tough to find ways to spend quality time with your furry best friend. Although we’ve seen a significant rise in the popularity of pet-friendly establishments, dog owners are still presented with the unique challenge of finding exciting excursions that extend beyond the typical neighborhood walk. Luckily, Arizona offers some of the most unique and exciting pet-friendly day trips that you can imagine. From the eerie alleys of historic ghost towns to the tranquil beauty of botanical gardens to the delectable tables of Sedona wineries, Arizona has something to offer to every pet (and their owner). Here are just a few of our personal favorites. The Petrified Forest National Park is nothing, if not awe-inspiring. This National Park in northeastern Arizona is most well known for its colorful array of petrified wood and its breathtaking views of the painted desert. Luckily, as long as you have a leash, your furry friend is more than welcome to wander the rainbow-colored wilderness at your leisure. In addition to the forests and overlooks, this National Park is also home to the Rainbow Forest Museum with a number of unique paleontology exhibits, making it a perfect day trip for you and any of your athletic fur children. If you are driving to the National Forest then there is a $20 parking fee or a $10 per person entrance fee. Alternatively, you can drop $30 on an annual pass and come check out the park anytime you want! If you are looking for a leisurely but scenic day out with your pup, then you need to look no further than the Tuscon Botanical Gardens. With more than five and a half acres of pristinely kept greenery, the gardens boast a wide variety of beautiful and intriguing flora and fauna. The gardens are opened from 8:30 a.m. to 4:30 p.m. during the summer months, May through September, and day passes cost about $15. Although historic Tombstone probably conjures up mental images of a sharpshooting Val Kilmer dryly telling you that he’s your huckleberry, it also happens to make a fantastic pet-friendly day trip. This infamous mining town sits at a healthy elevation of more than 4,500 feet and is located in the San Pedro Valley. There are an endless array of activities for you and your FBFF (furry best friend forever) to enjoy. With numerous museums and a plethora of delicious restaurants nearby, Historic Tombstone is a must-see for the history-loving dog owner. Although scenic wine tours and your canine bestie don’t typically go together, Sedona Red Rock Adventures, a pet-friendly tour company, is committed to breaking down the barrier between great wine and furry companionship. These private tours and all personalized to fit your specific group and include a wide selection of different offers. You can play it safe and stick to the local winery tours or get a bit more adventurous and enjoy a backpacking trip, camping trip, or even a Grand Canyon Excursion. Whatever you and your pet want to do, Sedona Red Rock Adventures can help make it happen. Due to their customized nature, the cost of this particular day trip isn’t exactly budget friendly. Most tours cost more than $100 per person and some of them extend up to $495/person. Goldfield Ghost Town is anything but boring and deserted. This quaint but activity packed town has a plethora of offerings for you and your furry buddy. You can pan for gold, tour the mine, ride on the one of a kind narrow gauge railroad, or just sit back, relax, and watch a chili cook-off. Whatever you decide to do, Goldfield promises a fun-filled summer excursion that you won’t soon forget. 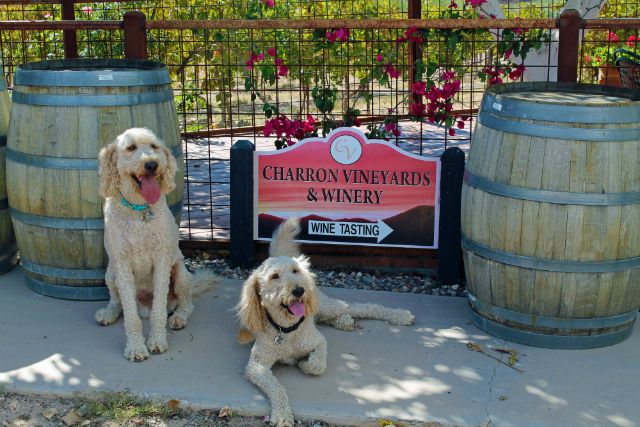 Although your pup can’t partake in the delicious wines produced in the Charron Vineyards, this shouldn’t discourage you from exploring them with your furry friend. Only a 30-minute drive south of Tuscon, the winery’s breathtaking location in the Empire Mountains gives you a spectacular series of mountain views to accompany one of the winery’s delicious Merlots. Resting at 4200 feet, the dog-loving winery offers gourmet picnic baskets, vineyard tours, and incredible dining experiences that will have palate singing. The winery’s tasting room hours are from Thursday to Sunday 10 am to 6 pm. It’s not often that the phrases “Air and Space Museum” and “Dog-Friendly” go together in the same sentence. However, in the case of the Pima Air and Space Museum, we are pleased to report an exception to the rule. Not only is the Pima Air and Space Museums one of the few dog-friendly A&S Museums in the world, it’s also one of the largest. With more than 300 air and spacecraft ranging from recent technologies to historically relevant vehicles, there is plenty to do and see at this incredible place. After you and your pet saunter through the magnificent exhibits, you can swing by Delectables for a pet-friendly dining experience in Tuscon. The museum is opened 7 days a week from 9 a.m. to 5 p.m. and 1-day passes cost about $16/adult. The McCormick-Stillman Railroad Park in Scottsdale, Arizona is a superb day trip for you, your family, and your furry friend. With a unique railroad museum, antique carousel rides, and a relaxing grassy landscape, the Railroad park makes for a perfect afternoon getaway for you and your pet. Although it can sometimes feel like a challenge to find dog friendly activities near you, there’s always something just around the corner if you are willing to look. Arizona is a beautiful state filled with a vast array of amazing destinations, landscapes, and activities. If you’re willing to do a little digging (and maybe a little driving) there are more than enough activities to keep you and Fido occupied for an entire summer! What do you think of our list? Do you have any other recommendations or a favorite dog-friendly destination that didn’t make it? Let us know in the comments or social media!